There will always be a special song you love listening to more and more. You may even like a section of the lyric of that song and each time you hear it, it feels like you are listening to it the first time. 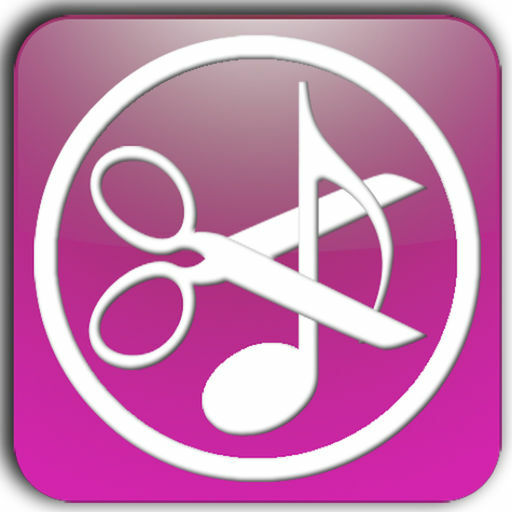 Why not use iPhone ringtone cutter to cut it and use it as your iPhone ringtone? Part 1: What Is iPhone Ringtone Cutter and Why Use It? Customizing your iPhone ringtone is now much easier because of the iPhone ringtone cutter availability. You want to use that part of the song you like as your ringtone, but you don’t know how to cut out the part you love most. That is what many iPhone users used to experience in the past, but ring cutter for iPhone has solved that because you can now cut only that part you like and use it as your ringtone, alarm tone and notification tone. With iPhone ringtone cutter, you can create unlimited ringtones, notification or alarm sound from an existing audio file in just a few steps. Some users face doubts when it comes to customizing iPhone ringtones and transferring media. This is the most popular question that iPhone users ask online. Mainly, iPhone users demand new ring cutter for iPhone software that will also help in transferring media. iTunes has acted weird on several occasions when users try to transfer documents and files from their PC to iPhone and vice versa. Hence, the need for an alternative means of transferring media files. If you have had a bad experience with iTunes and looking for better alternative software, look no further because we’ve found the perfect solution for you. 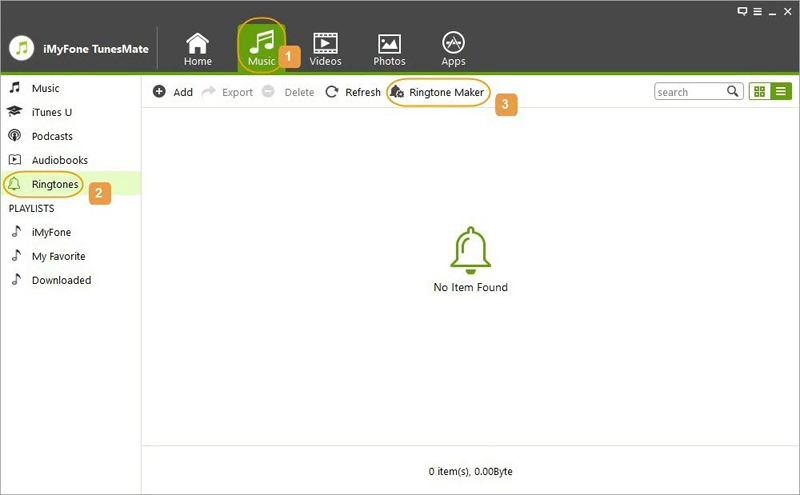 The perfect solution is no other software than the iMyFone TunesMate software. 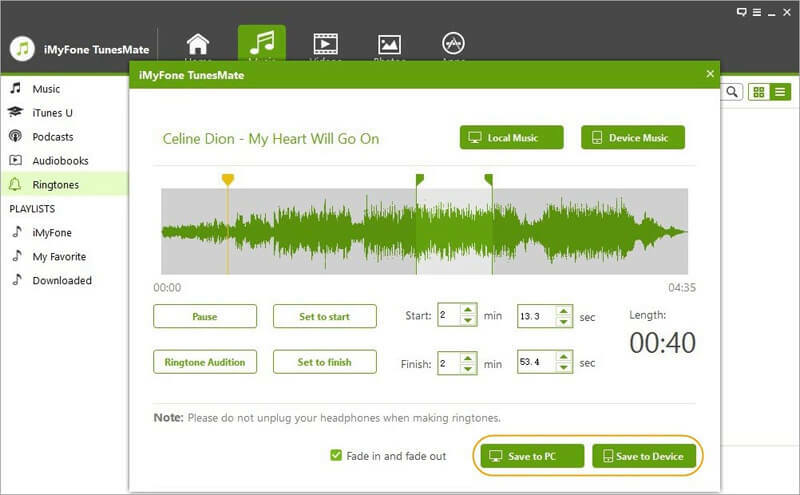 iMyFone TunesMate is the best alternative third-party application to iTunes. 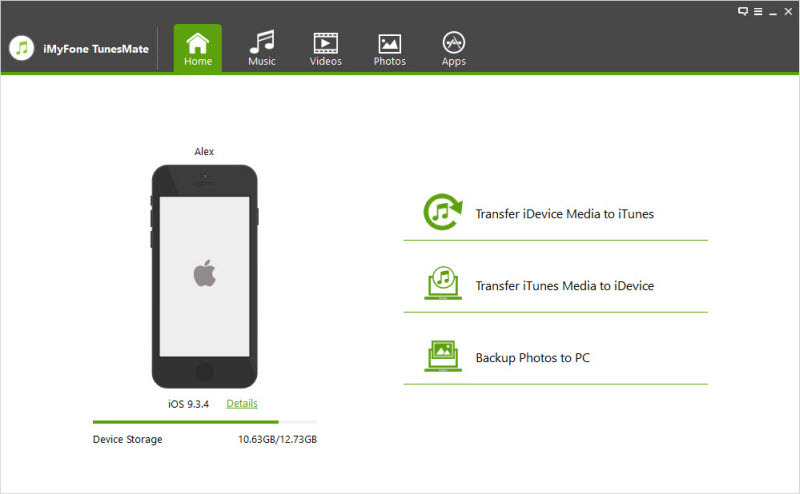 It is compatible with both Windows and Mac and can also be used to manage data on iPhone/iPad/iPod touch. Make iPhone ringtones smartly: pick up any song from your device or computer for making iPhone ringtones. Freely choose a section of a song and cut it as a ringtone: "Set as start" and "Set as finish" tabs are available to set ringtone start and finish point. Preview ringtone content before saving: "Ringtone Audition" tab allows you to preview ringtone content. Save ringtone on computer or iPhone: You can save ringtone not only on your iPhone, but also on your computer. 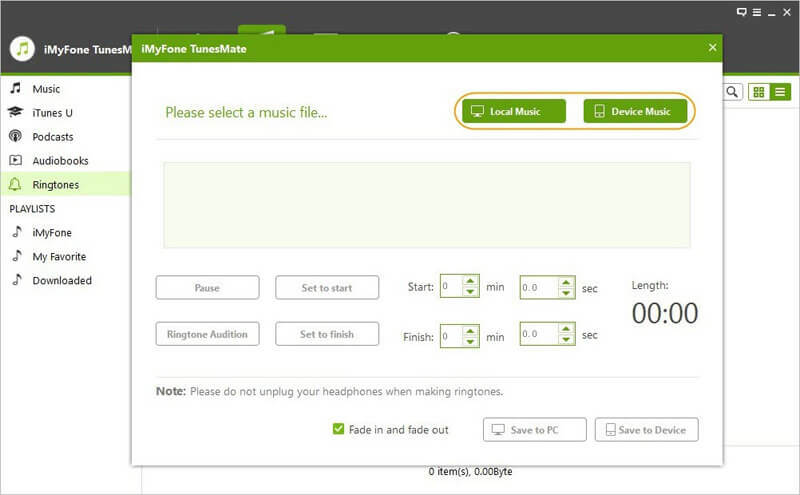 Step 1Connect your iPhone to your PC and launch the iMyFone TunesMate ringtone maker. Step 2Select Music tab, choose Ringtones from the left side bar, and then click Ringtone Maker at the sub-menu bar. Step 3Choose the song you wish to cut after you click Device Music or Local Music. Step 4Listen, select and cut the part of the music you want as your ringtone, which should be no more than 40 seconds. Step 5Preview it with "Ringtone Audition" and then save to your PC or device. Note: You can also use fade in and fade out to make your ringtone sound smoothly. This ringtone maker offers a lot of freedom when it comes to customizing your ringtones in unique ways. Its interface has a beautiful dark texture with realistic sliders and glowing highlights. You can change the playback speed on Ringtone Maker Pro and also change the sound pitch to funny ringtones. You can also convert female artist’s sound into male or vice versa. Even if you want to change country music into club dance on Ringtone Maker Pro, it is easy. You just need to accelerate the speed of the song. The interface of Ringtone Designer Pro is just fantastic. If you are using it as your ring cutter for iPhone, just select the song you’d like to customize as your ringtone, swipe the audio wave to select the part you would like to use and create your ringtone – it’s that simple. 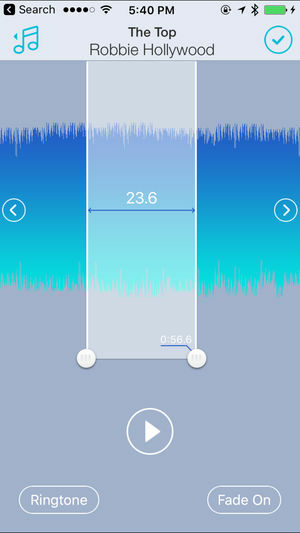 Creating a ringtone from music library, you just need to drag the sliders on the waveform to select the part of the music you want. If you are recording your own music, you have the speaker and a big record button to make your recording smooth. This ring cutter for iPhone has a great mix of useful and straightforward controls. 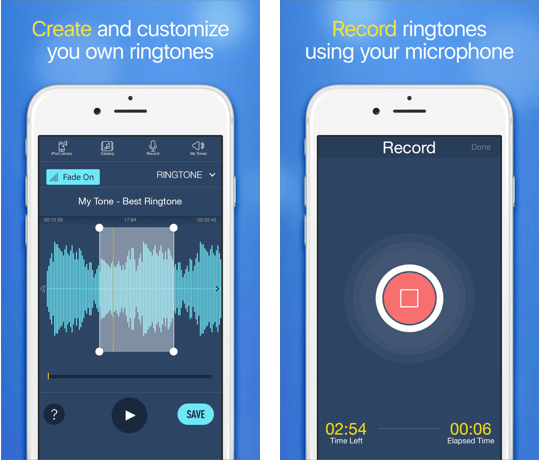 Ringtones for iPhone offers three ways to add ringtones to your iPhone. You can use music from your iPhone’s music library and edit it using the in-built editor. 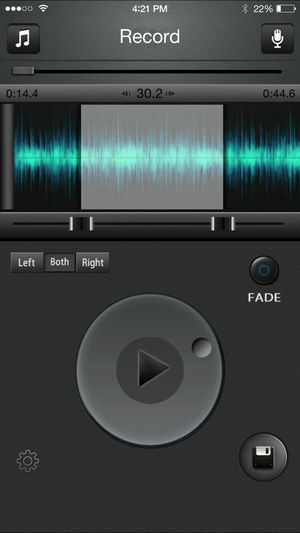 You can also record sound using the app’s recording feature to create your ringtones. Thirdly, if you are just looking for something quick ringtones, there are several pre-made ringtones in the app which you can use. Although there are many iPhone ringtone cutters out there, iMyFone TunesMate remains the best because it is easy to use and has several features other ring cutters for iPhone don’t have.